The dish is simple – stuff a chicken with stuffing and stuff that into a duck into a Turkey. Throughout history large meats have been stuffed with smaller ones, so the concept is not that creative. 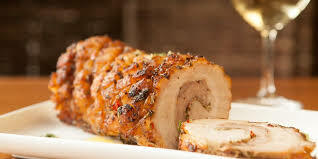 It is similar to the Italian Porchetta, which is a pork loin wrapped in pork belly and slowly roasted. The birds are all deboned, with the exception of the wings and the legs of the Turkey as to presented it at the table looking like a Turkey. Upon cutting, to the diners delight are layers of succulent and tasty meat. 1. Brine the birds. All the birds will be brined for 24 hours. The purpose of brining is to break down the cellular structure to tenderize, as well as to fill the cells with the flavors from the birne. 2. Debone and cook the skins separately for 8 hours. We will be removing the skin of both the chicken and the duck and cooking it for 8 hours at 180 degrees making them tender allowing the fat to render and allowing them to “melt in your mouth.” This is especially important given the fat content of the duck skin and that the skin is cooked on the inside. 3. Foie Gras Torchon. Next, we will stuff the chicken with Foie Gras Torchon (a traditional stuffing also is available). The Torchon actually refers to the shape as it contains only Foie Gras. Torchon means “dish towel” in French, a towel was traditionally used to wrapped the Foie Gras into the characteristic log shape. 4. Forming the Roulades. The chicken will next be rolled around the Torchon into a Roulade (fancy French word for log, not to be confused with Torchon….ah, merde!). The skin is then reattached using Transglutaminase (which is a natural enzyme that binds the proteins) and then cooked Sous Vide. Once cooked, the Chicken Roulade will then be wrapped in first the Duck meat and then have its skin reattached and made into a even larger Roulade. The last step is placing the “Ducken” into the Turkey, which you guessed it, will be then glued into a giant Turducken Roulade. 5. Caul Fat. The last step will be to wrap the Turducken with Caul Fat, also called crépine or fat netting, which is the web of fat that surrounds the stomach of most animals. This will render during cooking and keep the Roulade moist. This is where we stop and what will be delivered. 6. Slowly Roast for 3-4 hours. The Turducken will be slowly roasted for about 3-4 hours and then will be easily sliced and served. We also will provide a Turducken velouté (fancy French term for Gravy) made from the bones of the poultry and a Cranberry Gastrique (sweet and sour to cut the richness of the meat). The Turducken includes a 20 lbs. Turkey (weight includes bones), 6 lbs. Duck, and a 4 lbs. Chicken and will easily feed 20 people…and provide several days of Turducken sandwiches.